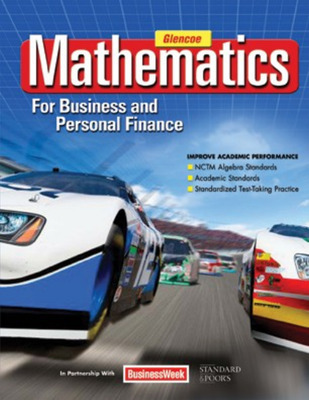 Glencoe’s Mathematics for Business and Personal Finance is the only text on the market that offers teachers point-of-use online professional development, interactive online help for students and the option of purchasing an interactive online text with a grade book. As always, we have maintained our exclusive coverage of key core academic content, and our research-based reading strategies. When it comes to helping students and making life easier for teachers, Glencoe is number one! Online Personal Tutor, accessed via the Online Learning Center, shows real teachers walk students through problems online. StudentWorks Online with Advance Tracker is an interactive online text with a grade book and reporting for the teacher. Professional Development for teachers at point-of-use in Teacher Wraparound Edition contains video clips of master teachers presenting math concepts (available with easy online access for teachers).